House of Maths School Workshops Primary & Secondary in Dorset & South - WHICH IS BETTER: METRIC OR IMPERIAL? This mess needs clearing up, so let’s decide here and now which is better: Metric or Imperial? ROUND 1: WHICH SYSTEM MAKES MORE SENSE? The Metric system started in France during the 1700’s. It’s based on the metre (length), gram (weight, or more properly “mass” – see here for the difference) and litre (volume). “Metric” comes from the word “metre”. There’s also a system of prefixes for making things bigger (kilo- , mega- , giga- , tera- ) or smaller (milli- , micro- , nano- ) in multiples of 1000: think of your milligrams of medicines or your gigabytes of computing power. The metric system is decimal because it is always based on powers of 10. LENGTH: There are 12 inches in a foot, 3 feet in a yard, and 1760 yards in a mile – a curious choice of number with a long and confusing history based on even older lengths called the FURLONG, POLE and CHAIN. WEIGHT / MASS: There are 16 ounces in a pound, 14 pounds in a stone, and 8 stones in a hundredweight (or 7 stone 2 pounds if you’re in North America – somewhat confusingly!). CAPACITY: there are 20 fluid ounces in a pint, 8 pints in a gallon, and other units as well. Again the rules are slightly different in the USA. These bizarre conversion factors and cross-continental differences and are a bad blow for Imperial, whereas the metric system of prefixes deals effortlessly with the miniscule and enormous quantities of modern living – like microns or megabytes. But the real clincher for metric is how beautifully it has been designed: one cm3 is exactly equal to one ml (millilitre), and a litre of water weighs precisely one kilogram. Now that’s beautiful! WINNER: A CONVINCING WIN FOR METRIC. ROUND 2: WHICH IS MORE INTUITIVE? Let’s take length: Most everyday objects we measure are either something you use (a book, a door) or a person (how tall do you think she is?). The inch and foot are just the right size for these measurements! 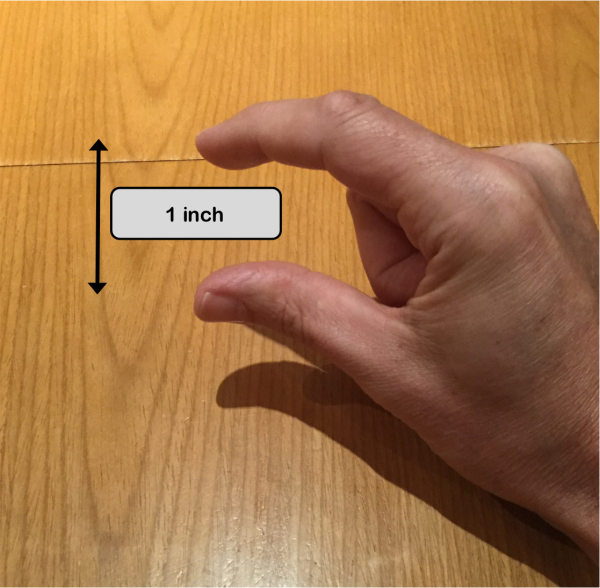 Most of us can imagine someone who’s 5 foot 4 quite easily: a foot is, well, about the length of an adult’s foot, and the inch is the distance between your thumb and forefinger when you hold them parallel as if to say “about this big” (see picture). But “one point six three metres” or “163cm” are both harder for us to process – the metre is too large a unit, and the centimetre is too small a unit. 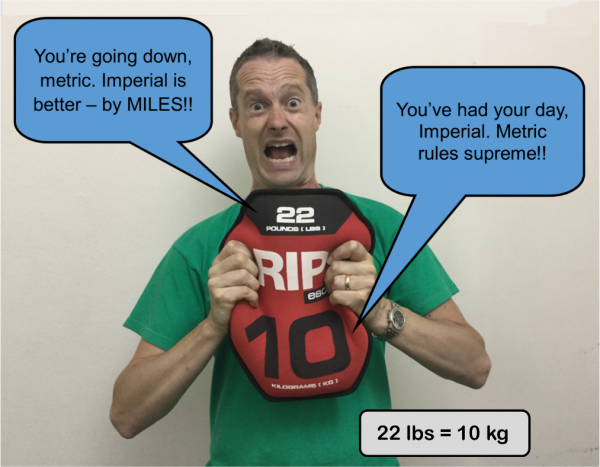 Now take weight: Again, the Imperial units were designed with everyday objects in mind – “four ounces of butter” is easier to handle than “114 grams”: the grams are too accurate! So although ingredients such as flour, sugar and butter are now sold by the kilo, many of us still use ounces to weigh them. When weighing ourselves, compare these three equal values: 159lbs, 11 and a bit stone, or 72kg. For me, the kilos are easily the most intuitive unit – this time the stones are too crude a unit and the pound a little too accurate. 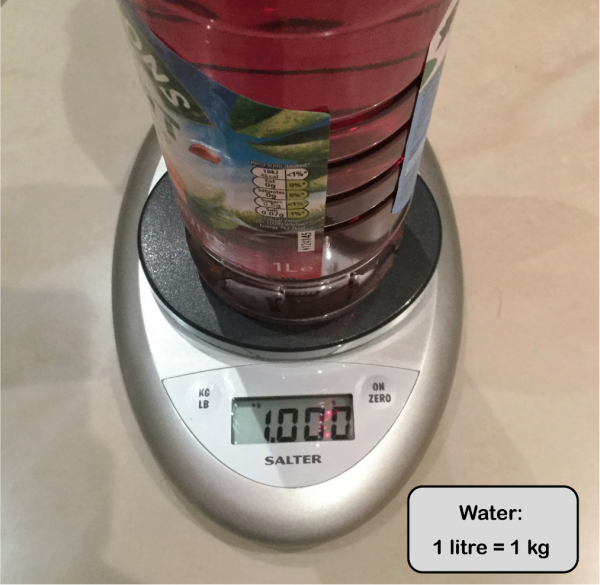 And finally volume: now both systems are easy to picture: we all know what one pint and one litre look like (if you don’t then look for a pint glass and a one litre bottle of juice in your kitchen). Overall, for measuring everyday objects Imperial units are generally in the “Goldilocks zone”: not too small, not too big, but just the right size– because that’s how they were designed!! WINNER: IMPERIAL SHOWS ITS CLASS! ROUND 3: WHICH IS BETTER FOR CALCULATIONS? 2.5km = 2500m, easy; but try changing two and a half miles to yards – not so easy! Similarly, 83kg = 83,000grams (easy), but try changing 13 stone to ounces (much tougher!). The reason Metric packs such a punch here is because it is decimal i.e. based on tens, so as long as you know how to move the decimal point, that’s all you’ll ever have to do to convert between small and large units. WINNER: A CLEAR WIN FOR METRIC. ROUND 4: WHAT DOES EVERYONE ELSE USE – AND SHOULD WE CARE? If you’re reading this and prefer the Imperial system it may be because it’s what you were brought up with so it’s what you’re used to; but your average Frenchman, or Chinese woman wouldn’t understand what a mile, a gallon or a stone means. A huge advantage of the metric system is that it is standardised – it’s the same all over the world. Imperial units are to be dropped from the GCSE maths syllabus in 2017 for the first time. And here’s a telling rule from gov.uk : with no mention of feet and inches: “Children must … use a car seat until they are 12 years old or 135cm tall”. Should we care? Absolutely! These institutions have chosen to switch to metric for the good reasons laid out in this article, and I think we should bravely move forward and adopt them universally – even phasing out miles on our roads in favour of kilometres. WINNER: METRIC WINS WITH A KNOCKOUT PUNCH! Metric has punched above its weight in three out of four rounds, and so I can now declare Metric to be the winner! Even so, I hope I’ve convinced you that there is no single perfect unit for length, for weight or for volume – it depends what you are measuring and why! A book might be “about 2 inches thick” just as a wooden beam might need to be “28 mil”. I’ll leave the last few words to the Imperial system: it’s lost today’s fight but is so deeply ingrained in British culture that it won’t disappear completely anytime soon. Our language is peppered with yardsticks and milestones, “ounces of strength” and “inching towards the finish line”. I have a fondness for Imperial’s linguistic legacy: we can do “tonnes of work” or have “…legs that go on for miles and miles” [in the words of Right Said Fred].